I live on the Falkland Islands and I'm trying to purchase a complete set of ink cartridges for my iPF6200 printer. I've looked on your web page and can find all the colours except the blue, black and matte black ink tanks. Can you please tell me if you would be able to supply these and also the price please? I would get them delivered to a UK address for onward posting to me here in the Falklands. I look forward to your reply. Kind Regards, Marlane Marsh. We can't guarantee that the Canon iPF6200 cartridges will work in your printer when they arrive with you as our cartridges only work in printers that were purchased in the UK. However, if your printer was purchased in the UK, we now have stock of the full range of Canon ImagePROGRAF IPF6200 ink cartridges. You can buy the cartridges individually or we currently have a set of four cartridges and then you would need to buy the others inks as single items. Buying your new iPF-6200 inkjet cartridges takes merely a couple of minutes, and that is not much when you compare it to the monotonous mission of phoning plus visiting every last supplier locally to buy your replacement supplies. There's no need to go to the trouble. We have carried out the hard work so that you can purchase all of the replacement ink cartridges categorised as a match for the iPF 6200 inkjet printer. Save your time and also money if you buy your ink supplies from Cartridge Save! Buy your Canon print cartridges now with Cartridge Save and get the offer of free delivery as standard. To affirm that we will only ever deal in high-quality cartridges, each product is provided with Cartridge Save's full thirty day cash-back guarantee - if you should find complications within the thirty days then post the inkjet cartridge back to our store and we'll give you back your money. Aimed at small businesses focused on graphic arts and CAD printing, the Canon ImagePROGRAF iPF6200 is a versatile 24-inch format printer with powerful features that make it a durable workhorse. 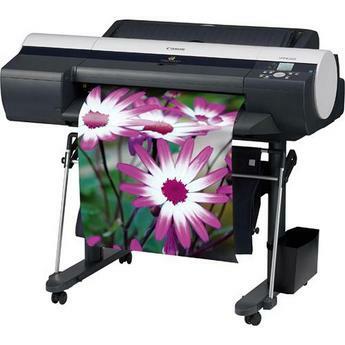 The ImagePROGRAF iPF6200 large format printer promises vibrant images and long-lasting output, while the user-friendly interface lets workgroups accomplish more in less time. However, the iPF6200 is quite expensive to run, is heavy, and lacks intuitive features. This 12-colour, 23-inch printer features a sleek frame that measures 39 inches tall and 34.3 inches deep. The Canon ImagePROGRAF iPF6200 inkjet printer weighs approximately 55Kg and the exterior includes a small control panel on the right-hand side. Canon integrated an 80GB hard drive into the Canon ImagePROGRAF iPF-6200 printer, which runs on 384MB of RAM. The connectivity ports are at the back, giving users a choice between Ethernet and USB. The maximum print resolution is 2400x1200dpi. Fast, user-friendly, and can be shared by a network, the Canon ImagePROGRAF iPF6200 lets users accomplish more print jobs in a day. For speedier data transmission, the Canon iPF6200 can be connected using Firewire. LUCIA 12-pigment inks provide high-quality and long-lasting results so images and drawings look more accurate. There are pre-defined controls for monochrome output, photo printing, and proofing as part of the intuitive interface of the Canon ImagePROGRAF iPF6200. This printer is also notable for its quiet operation. The Canon ImagePROGRAF iPF6200 colour printer doesn't offer Wi-Fi, direct print capabilities, and cheaper inks. The device uses as much as 4 picoliters of ink droplets, which is quite plenty when compared to other high-yield printers. Some components of the bundled software that come with the Canon ImagePROGRAF iPF6200 large format A1 printer are unnecessary for professionals who already have better graphics and imaging programmes.